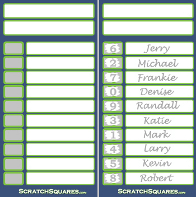 The 10 Line Baseball Scratch cards can be used for any individual game, the full World Series or for any Playoff Series. 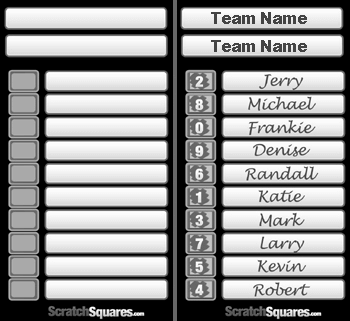 Start by writing the two teams in the spaces provided, then have the participants write their name on the line or lines of their choice. Once the lines are full, scratch off the covering to reveal the numbers. If you are using these for a single game, there are various methods of determing winners. It's all based on how many winning squares you would prefer to have per game. You could have a winning square at the end of each inning, even or odd innings, or every 3 innings. This is completely up to the person hosting the pool. 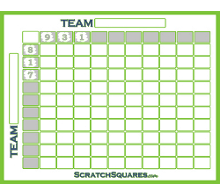 To determine a winning square you will total the runs scored by both teams, if it's double digits you will use the last digit. Example of a Winning Square: At the end of the 1st inning the Braves have 3 and the Indians have 1, the participant with their name in the square beside the number 4 would win. 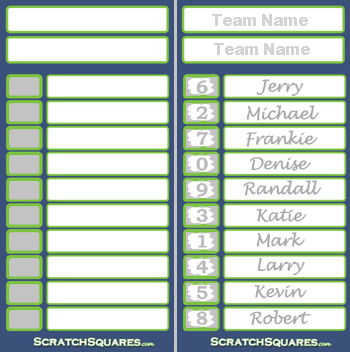 To use these scratch cards for the World Series or for any Playoff Series, you could use a separate card for each game, which allows the participants to get a variety numbers. You can also use the same card and just use the final score of each game for the entire series.